Conte Sans was designed as a more generic version of my Practica. Around 1998, while maintaining Practica, I thought that I could make my new font in a humanist sanserif category with a bit narrow proportion by modifying Practica into a little more rational look. Practica has narrow proportion, this would be a good basis for this new typeface. I began with the heavy weight, then with the light weight. The heavy weight was almost completed then, but the light weight had not been done yet. Later in 2002, to use this new typeface for my music project, I completed the heavy weight with the alternate characters. But still the light weight, the trial italics and the other interporated three weights were left imcomplete and abondoned. 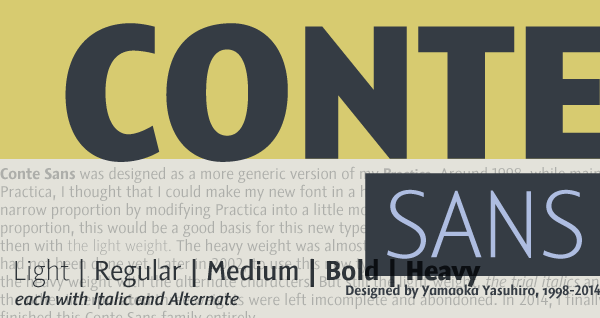 In 2014, I finally finished this Conte Sans family entirely. Conte Sans was designed by Yamaoka Yasuhiro 1998-2014. ©2014 YOFonts/Yamaoka Yasuhiro.